This is a sponsored guest post and was not written by me, buy I’m loving some of these easy Halloween crafts! The milk jug jack o lanterns are awesome! Start saving your milk jugs now!! Halloween is right around the corner and it’s a festive and fun time for everyone. Children love to dress up and go trick-or-treating and parents love to hand out candy to all the neighborhood children. However, decorating your house can be an expensive proposition. If you’ve been to any of the department stores looking for fixtures and fun accessories for you home, then you’ve seen how costly it can be. If you’re wanting to save some money this holiday season, check out some of these do-it-yourself Halloween decorations. Putting up decorations outside your house is always a great way to create an inviting atmosphere for kids, as well as parents. If you want something cheap, quick, and easy to put up around the outside of your house, you can make some jug heads. They look similar to jack o’lanterns, but you use old plastic gallon milk jugs. You draw different faces on the jugs and cut a hole in the back of the jug. When you place them outside your house, you can put a candle or a light inside and they’ll brighten up your house and walkway. The faces will light up and look really fun. This is a really affordable option for people to use those jugs that they would just recycle anyway. Bats are really iconic of the Halloween holiday. 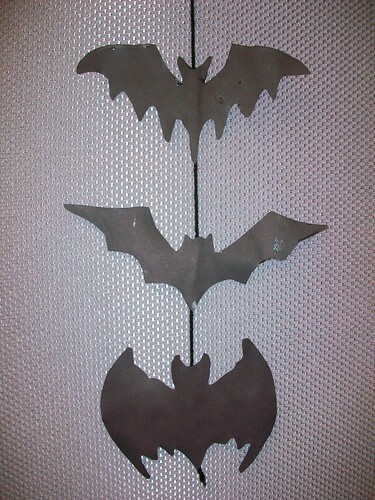 Instead of buying a bunch of bats to throw up around your house, you can make your own. All it takes is some string, construction paper, and scissors. Go to the store and get some large sheets of black construction paper and draw an outline of a bat and cut it out.. You can do different sizes or you can just use the same outline and trace over it. Once you’ve cut out all the bats you want to put up, thread them with some string and hang them all over the inside and outside of your house. It’s super easy and a great way save some money. Jack o’lanterns are really fun but, if you’ve ever carved a pumpkin then you already know that it’s usually more trouble than it’s worth. It takes a lot of effort and makes a big mess. It’s always harder to even get a nice looking face carved out of the pumpkin. On to of that, they start to rot within days. Instead, consider getting some pumpkins and paint them. This way it’s really easy to draw fun and spooky faces on the front of them and they’ll keep for a lot longer and you won’t have a wilting pumpkin stinking up your front porch. You can look for many more ideas on your computer, or if you have a good mobile broadband connection, use your mobile to browse through some of the options. There’s no reason why you should have to go broke just to get into the spooky mood for this Halloween season.